“Six years ago, when I entered USA as a refugee, I never imagined that someday I would be standing in front of you,” said 29-year old Holakou Rahmanian, speaking to professors of mathematics and computer science at his graduation from the University of Santa Cruz, California in 2018. 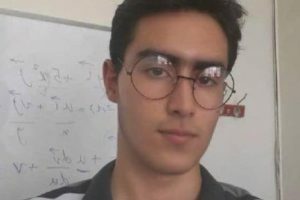 As a member of the Baha’i religious minority, which is subject to official discrimination in Iran, Rahmanian was not allowed to study at a university in his home country. After immigrating to the U.S., however he completed a degree in computer science in 2012, and recently received his PhD. The Baha’i are a peaceful religious minority, who adopted their own faith in the 19th century but are viewed by the clerical establishment of Iran as deviants and are persecuted. Rahmanian did successfully pass the national competitive exam for mathematics, arts, and foreign language, achieving high national rankings in all subjects, but he was told by testing administrators that he had failed. When he protested the result, he says he was told that as a Baha’i he was ineligible from attending university. 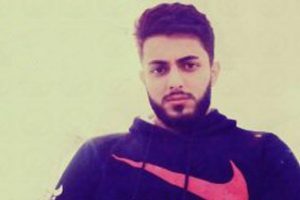 He says he was never given a decision about his rejection and the reason for it officially in writing but was repeatedly told that “higher authorities” wanted to keep Baha’is out of Iran’s universities. Rahmanian was left with no other option than to continue his education with with the Baha’i Institute of Higher Education (BIHE), a secret entity that offers university courses to Baha’is. 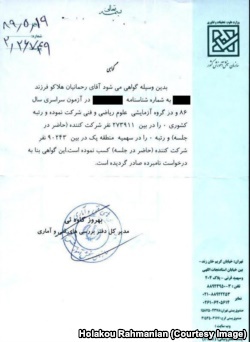 The acknowledgment Letter issued by Iranian Ministry of Science, Research and Technology about Holakou Rahmanian. BIHE was launched in 1987 by the Baha’i community, but has never been officially recognized by the Islamic Republic, and has been forced to operate in secret. In 2007, during Rahmanian’s first semester at the BIHE, the administrators set up a makeshift campus in a rented office space in a four-story building in Tehran. After one semester, many of the students were threatened by the Islamic Republic’s intelligence agents and the BIHE was forced to vacate the building. Nowadays, BIHE runs mostly online, via email and shifting websites to cover up its activity from the government’s cyber monitors. Another dilemma facing BIHE graduates is the fact that since it is not registered as a university by the Islamic Republic, most universities across the world do not recognize the diplomas it grants. 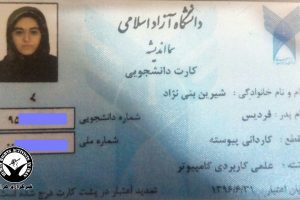 According to Article 1 of Iran’s Supreme Cultural Revolution Council’s Student Qualification Regulations, approved by Supreme Leader Ali Khamenei in 1991, students who take the national enrollment exam must either be Muslim or followers of other constitutionally sanctioned religions. Article 3 states that if a student is discovered to be a Baha’i after enrolling in a university, he or she will be expelled. Speaking to Radio Farda, Rahmanian expressed his deep satisfaction when he discovered that more than 65 universities outside of Iran, about thirty of them in the United States, actually do accept BIHE students into their graduate programs. 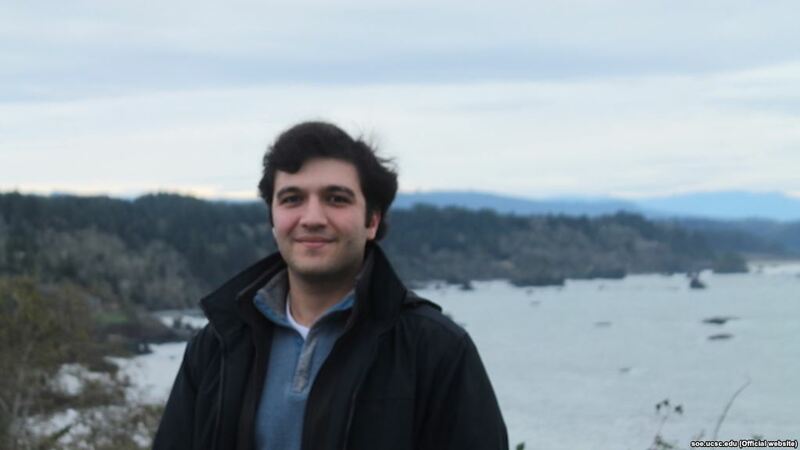 While studying for his PhD at Santa Cruz, Rahmanian worked as an intern trainee for some major international corporations, including eBay, Google, and Microsoft. Rahmanian will now visit Japan to serve as a guest researcher at Kyushu University before joining Microsoft full-time. Rahmanian says his dream is to return to Iran and teach at the BIHE.